Greatness has never looked so soggy. PHOTO: Ski Banff-Lake Louise-Sunshine. Pond skimming, the spirit of spring skiing and everybody’s second favorite snow sport, will officially have a world champion in 2016. 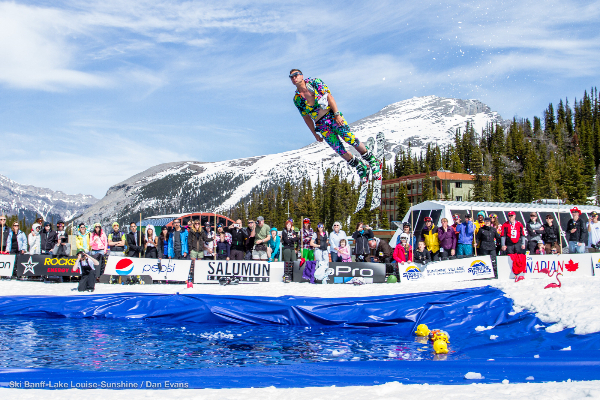 Ski Banff-Lake Louise-Sunshine has announced that it will host the First Annual Pond Skimming World Cup on May 23, 2016 in conjunction with POWDER at Sunshine Village. "Sunshine Village currently hosts one of the most iconic pond skimming competitions in North America and serves as the perfect location to host a world championship next season," says POWDER's General Manager, Ashley Otte. Qualifying skims will occur across North America, with all action culminating in a unified championship at one of the most legendary pond skim locales in the world. This year, Sunshine Village held its 87th Annual Slush Cup, so it knows a thing or two about skimming tradition. And while the Slush Cup name will continue to live on, the 2016 installment will come with an additional distinction: Pond Skim World Cup champion. P.S. Can we get this guy there?